Hello everyone! Enza here to share a planner spread with you today. The colors in the Sundance Kit are perfect to embellish September pages and give you a feel of the upcoming fall season. The first thing I usually do when I plan my week is write down appointments, activity schedules, and to-do lists. This is a crazy month for us, so the best way to get everything done and get a sense of how busy our week is going to be is to have it all in front of my eyes. Once that is done, I start adhering die cuts and sticker sentiments to fill out the empty spots. I used several pieces from the Creekside collection ephemera pack and exclusive printables that coordinate perfectly with the rest of the colors in the kit. I am a sucker for inspiring and encouraging phrases and sentiments, and you can find a few of them across the spread, along with floral pieces in beautiful fall colors. That is all for today, friends! I hope you enjoyed looking at my planner pages and will feel inspired to use bits and pieces from this month kit to decorate your own spreads. Visit the Clique store for other fun items that are perfect to personalize your planner. Categories: Clique Agenda | Tags: 1canoe2, CK Sundance Kit, Clique Agenda, clique kits, Enza Gudor, Planner Pages | Permalink. Hello, everyone! Enza here and today I’m sharing a planner spread using the gorgeous June Aquarelle kit. I love the exclusive printables every month, and the ones included in the June kits are no exception. Fun and colorful, I had to use them in my spread. One of the things I always do when it comes to digital items is print multiple copies of my favorites in different sizes. Photoshop is a fantastic tools for this, but I find the Silhouette Studio software much easier to use. I just drag (or copy/paste) the images into a new workspace, duplicate them and modify the size as I like before printing. Easy peasy. I started by placing the flowers across my spread and creating clusters here and there. I also printed the days of the week strip that comes as a printable with the Traveler’s Notebook kit. I love the font! Next, the butterflies, which were fussy cut out of a 3×4 exclusive card included in the main kit. The triangles I added on the sides of both pages give the perfect touch of color. They are also from a 3×4 exclusive card. I adore this cute little tag! I had fun decorating my planner with the June exclusives this week. Thank you for stopping by. Have a lovely week! Categories: Clique Agenda | Tags: CK Aquarelle Kit, Clique Agenda, Exclusive printables, June 2017, Planner Pages | Permalink. Hello Clique Kits lovers! Evi here, and I have a very floral planner spread using the Wild at Heart collection from Cocoa Vanilla in the June 2017 kit. I love the rich navy colors mixed with the pinks, magenta, mints and corals in the collection. I used the cut apart sheet for cutting out the perfect sized rectangle needed to fill the entire space in my MAMBI inserts. My inserts are from my HAPPY planner 365 but I dislike the disc system and punch holes to put in into my Carpe Diem binder from Simple Stories. The ephemera die cut pack comes in the kit and I picked out all the lovely florals to add the details to my spread. I wanted to make sure I featured all the rich colors in this collection on this spread. The butterflies are also a nice detail in this collection. I wanted to incorporate the small positive affirmation pieces too. ‘Dream Big’, ‘This makes me Happy’, and ‘Memories’ add nice text to the layout. I added in a few details to my week ahead of time with a pink, blue and aqua colored ink pens. The rest of the space will be added as the week goes on. I hope you are inspired by my layout and try a version of your own. Categories: CK Kits, Study Hall | Tags: planner, Planner Pages | Permalink. This month, after I finished creating the layouts I wanted to make using the June Kit, I decided to use the leftover scraps and die cuts to embellish my planner page for September. I used adhesive to adhere two cards back-to-back from Clique Kit’s exclusives to add to my planner page. The “You Don’t Have To Be Perfect To Be Amazing” sentiment inspires me! Love it. I used gluedots to adhere the “She Belongs With Wildflowers” sentiment to the other card with the words. A girl can never have too many inspiring quotes in their planners to get them through their days. Each month, not only do I write down dental and doctor appointments, but I also include things such as water plants, laundry, clean the kitchen etc. to keep me on track. If you’re looking for a few fillers for your planners, check out the Clique Kits Shop, we have a variety of embellishments to help you get your plans started! 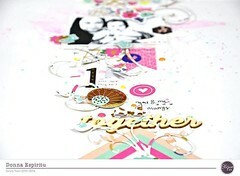 Categories: Clique Agenda | Tags: clique kits, Cocoa Vanilla Studio, Nicole Martel, Planner Pages | Permalink. Hello, everyone. Enza here with a planner spread featuring the new gorgeous March Play Kit. I love this kit to pieces. It is just beautiful. Such happy colors and fun patterns. I was so inspired by all the goodies in this month’s kit that I decided to make my own dashboard for March. I knew I wanted to use the Lil’ Bit Lovely patterned paper. I thought the chevron pattern would be cute to create a little pocket. As my base, I used a piece of white cardstock, which I trimmed to fit my Mini Happy Planner (it measures approximately 4.75” x 7”). I then did the same thing with the patterned paper. Since I wanted to cut the chevron paper in half, I first punched holes in it. That gave me an idea of where to cut. I used some foam dots to give dimension to the beautiful floral piece included in the ephemera pack, and added one of Dr. Seuss’s quotes that I have always loved as my inspiration for the month. I had a hard time choosing the bits and pieces to go in the pocket. They are all so fun! This is my monthly spread for March. I like to keep it simple and usually only jot down a few things. The weekly spreads are much busier. How lovely are these embellishments included in the kit? Don’t forget you can also download the exclusive printables that coordinate perfectly with the main kit. If you are a planner girl, the Clique store has a whole section where you can find stamps, stickers, monthly pages, washi, anything you need to complete your planner spread. Thank you for stopping by. Have a lovely day! Categories: CK Kits, Clique Agenda | Tags: clique kits, Enza Gudor, March Kit, planner, Planner Pages, Shimelle | Permalink. Hi there! Danni here again today, to share my weekly planner spread for Valentine’s week. I used mostly the February Clique Kit, Bee You. This kit features the Hazelwood collection by One Canoe Two and is just absolutely Stunning! I also added in some of the January, Hey Sugar Clique Kit. I thought I would share a picture of the beginning stages of putting my spread together. I love to use scrapbook paper as my full squares; to give it color & make it more of a cohesive planner layout. I inked the edges of my squares with Tim Holtz Distress Inks in Hickory Smoke & Shaded Lilac. This helps give it the look of dimension & shadows, without adding bulk to your planner pages. I used a couple of planner stamps from the Sweet Stamp Shop. I use these to keep track of my social media. Also, I just realized I forgot to mention I use the Happy Planner, by Me & My Big Ideas. I didn’t write too much in my planner, since I am decorating it almost 2 weeks early. I did however, make sure I left plenty of room, to add in more details as the week gets closer. Thank you so much for stopping by today! I hope I have inspired you to use your Clique Kits for your planner pages, not just your cards & layouts. They really are such an incredible tool for ALL your crafting needs!! Please be sure to share your planner spreads with us on Facebook…we LOVE to see what you create with our kits! Categories: Clique Agenda | Tags: American Crafts, clique kits, Planner Pages | Permalink. Hello everyone. I have a quick and easy planner page to share with you. I’ve already started plugging in my dates for March so I figured I’d go ahead and use the February kit to decorate my pages. I used some of the add-ons from this month’s kit and I love the pom-pom pen! There might be a few left in the planner shop if you think you might need one of your own. I try not to spend too much time on my planner page. Every month, I scrapbook my layouts first and then whatever embellishments are left, I decorate my planner page so I get the most from my kit and nothing goes to waste. Categories: Clique Agenda | Tags: American Crafts, Clique Agenda, clique kits, Nicole Martel, Planner Pages, scrapbooking | Permalink.